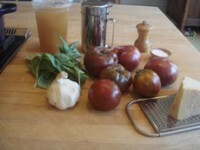 The best thing about the end of summer and the beginning of fall is the plentitude of heirloom tomatoes in the markets! Here is my interpretation of my friend, T.T.’s, recipe for getting the most flavor out of these. When a recipe calls for peeled, seeded, and chopped tomatoes, I usually ignore it. However, it would be best to do it in this recipe. 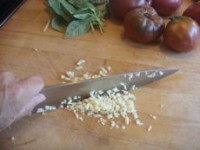 The best is to remove the stem end of the tomato with a small knife, and some people make a cross in the opposite end. 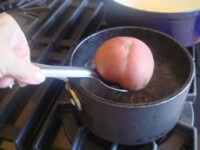 Drop the tomatoes in gently boiling water for no longer than 10 seconds. Transfer them to a bowl of cold water. Then, gently peel off the skins. To seed them, cut the tomatoes in half with the stem end on one side, and over a sieve in a bowl or measuring cup, insert 5 fingers in the open end and squeeze. Don’t worry if you don’t get out all the seeds. 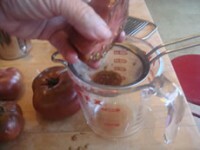 The liquid from the strained seeds can be added to the soup too. As T.T. would say, Mangia! To make the soup, in a heavy bottomed pan heat the olive oil over medium heat. Stir in the garlic and let cook gently until it turns slightly golden—be careful not to burn. 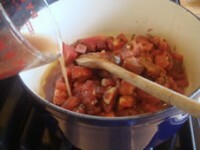 Immediately, stir in the tomatoes and gently saute until slightly thickened, about 5 minutes. Stir in the stock, and let simmer another 10 to 15 minutes. Stir in the basil and let simmer gently 2 or 3 minutes more. 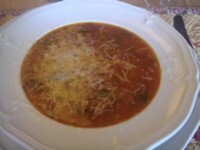 Serve in warm bowls with cheese on top. Note: T. T. prefers to cook the tomatoes longer than I do. She cooks them before adding the stock for 15 minutes; then, adds 3 quarts of stock and simmers the soup another 30 minutes. She says it gives it more flavor.